A Bureau of Land Management proposal to open 1.1 million acres of prime wolf, bear and salmon habitat in southwest Alaska's Bristol Bay watershed could become federal policy with the stroke of Interior Secretary Ken Salazar's pen. But environmental groups are lobbying hard to keep Salazar's signature off the BLM recommendation and prevent new mining on lands near Lake Clark and Katmai national parks, an area that has been protected from resource extraction activities since 1971. "Nothing happens until the secretary signs the paper, so we're saying, 'Don't sign anything. Send the plan back to BLM,'" said Jim Stratton, Alaska regional director for the National Parks Conservation Association. Opponents fear that if BLM's recommendation goes through, it will propel a modern-day gold rush in an area that is home to numerous iconic species, including salmon, caribou and moose. "Allowing mineral development is undoubtedly going to result in a rush to develop and the propagation of a new mining district," said Jeremiah Millen, field representative with the Alaska Wilderness League's BLM wildlands program. Critics also maintain that BLM's recommendation is based on a faulty environmental analysis of the impacts that new mining claims would have on the region's fish and wildlife, and that the agency ignored opposition from local residents and tribes. But BLM officials maintain that the recommendation follows a careful deliberative process and would open only a sliver of Bristol Bay's public lands to mining. For more than three decades, the 1.1 million acres were off-limits to mineral development because of unresolved land claims stemming from the 1959 Statehood Act and the 1971 Alaska Native Claims Settlement Act. The temporary ban on mining was supposed to last only until local native corporations and state and federal agencies worked through issues concerning land selections and development rights, according to Gary Reimer, district manager at BLM's Alaska office. The agency released its first resource management plan for the area in November 2008. Yet despite the area's unparalleled fish and wildlife habitat, including two of the world's most productive salmon rivers, BLM recommended that 99 percent of the lands be opened to hardrock mining. 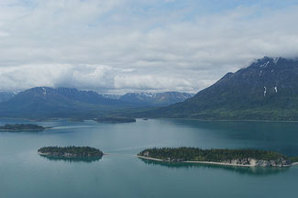 The decision has garnered attention in part because the BLM lands are close to the proposed Pebble Mine, a giant gold, copper and molybdenum deposit on the southwest side of Lake Clark National Park and Preserve. Environmentalists have waged a massive campaign against the mine, which they fear could forever alter the wilderness character of the Bristol Bay watershed and expose pristine salmon and trout habitat to acid mine drainage and other impacts. A report issued earlier this month by the National Parks Conservation Association identified the Pebble Mine as the biggest threat to Lake Clark ecosystem, noting that the mine is predicted to be a catalyst for industrialization in the headwaters of Bristol Bay. The report also noted that BLM's decision to open lands near Lake Clark and Katmai national parks could amplify mining activity in the region. BLM maintains that mining and environmental protection goals can be reconciled. For example, the agency recommended that 36,220 acres be designated as "areas of critical environmental concern," a designation developed to conserve important resources. 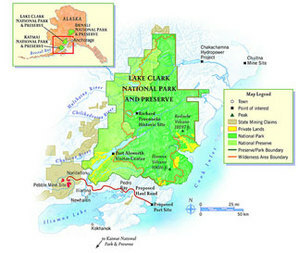 Lake Clark is the centerpiece of one of southwestern Alaska's most pristine national parks and preserves. The area is home to numerous high-profile species, including bear, moose and wolves. The Lake Clark ecosystem also supports one of the world's most productive salmon fisheries. Photo courtesy of the National Parks Conservation Association. And BLM officials insist that appropriate environmental measures are in place to protect the region's wilderness, wildlife and salmon stocks. For example, all mining proposals would be subject to National Environmental Policy Act review, and any approved project would have to include measures to protect sensitive lands from mining-related damage. Agency analyses also determined that the chances of large-scale mining in the contested area are slim, thanks to the significant depth of the minerals and a lack of nearby transportation infrastructure. Indeed, Reimer said the state of Alaska has already tapped the lands with the best mining potential. Out of the 1.1 million acres remaining under BLM control, Reimer said the agency expects that 150 surface acres will be disturbed by mining activities. "I know there are fears out there about wholesale mining, but we don't see the geology or economics being anywhere close to supporting that," he said. And despite ongoing concerns about the effects of mining in the area, Reimer said scientific studies show very few effects from mining on BLM land. "People always ask, 'Why didn't you consider the effects of mining?' Well, we very much did. We marshaled wildlife biologists, fisheries biologists and hydrologists, and the effects were not great, even cumulatively," Reimer said. "All things considered and all places considered, it didn't amount to much." If the agency's calculations prove wrong and the area does prove to be capable of supporting significant mining activity, Reimer said, the agency will have to redo its resource management plan to take that into account. BLM has recommended opening 1.1 million acres of public lands near Pebble Mine to new minerals development, but environmental groups are lobbying Interior Secretary Ken Salazar to withhold his support for the plan. Map courtesy of the National Parks Conservation Association. Click on the image for a larger version of the map. But critics say BLM's protections do not go far enough, and they say the agency overlooked important information in its decision to open the lands to mining. "They failed to show how allowing mineral development is in the public interest and the best use of those lands," Millen said. "In that plan, they did not put one protection in place for Bristol Bay. It's hard to believe that there are no resources there that warranted special protections." BLM did identify 45 rivers in the planning area as suitable for federal "wild and scenic" status, but the final plan did not recommend a single river for protection. Not even the Nushagak and Kvichak rivers -- two of the most abundant salmon-producing rivers in the world -- made the cut. Critics also say BLM failed to consider the value of Bristol Bay's commercial and sport fishery, which generates $360 million a year and creates about 12,500 jobs. More than half of the world's salmon take comes from Bristol Bay. "That fishery depends on clean water and pristine habitat," said Shoren Brown, director of federal salmon policy for Trout Unlimited. "And experience has shown that when a hard rock mine can't contain its waste, the first thing to go is the water quality." Additionally, environmentalists contend that BLM is greatly underestimating the mining industry's interest in the lands under its control. "If the likelihood of development on those lands was so low, why wouldn't they just keep the status quo and keep it off-limits to mining?" Millen asked. Gable is an independent energy and environmental writer in Woodland Park, Colo.